The toboggan run from the 1984 Olympics. Sarajevo, capital of Bosnia and Herzegovina, is famous for three major world events. 1.) The assassination of Austrian Archduke Ferdinand, the event which sparked World War I. 2.) Sarajevo Olympics of 1984 3.) The Siege of Sarajevo during the Bosnian War, 1992 – 1995. The Stari Most (English: Old Bridge). Notice the Christian cross on the hillside in the upper right and Muslim mosques below. Mostar in Bosnia and Herzegovina is all about its famous old bridge, Stari Most. 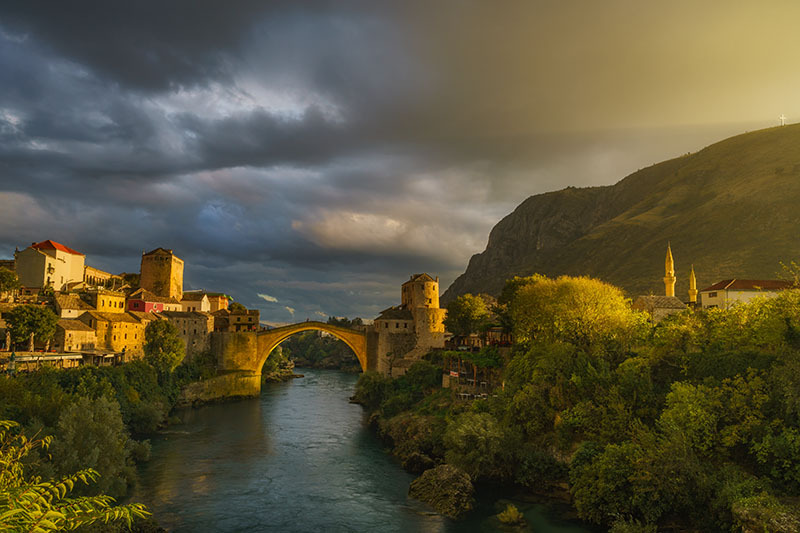 This bridge served as a link between the two sections of the city of Mostar, Catholic and Muslim, for over 425 years. It was destroyed by the Serbs and Croats fighting the Siege of Mostar during the Bosnian War in 1993.